What is inside that ship? I bet it’s bad news. Most of your time in Subnautica is spent deciding whether to listen to your curiosity or your terror. It’s a tough choice. Subnautica’s version 1.0 came to PC last night after entering early access in December 2014. (It’s still in game preview on Xbox One.) You play the single-player game as the survivor of a spaceship crash who lands on a planet mostly covered with water. From your lifepod, ocean stretches in all directions. Dive under the surface, however, and you’re greeted with a rich world of colorful plants and animals. You can harvest what you find for food, water, and crafting materials, but you regularly have to resurface for air. Go down too far after a glowing plant or a strange fish and you won’t have enough oxygen for the return trip. 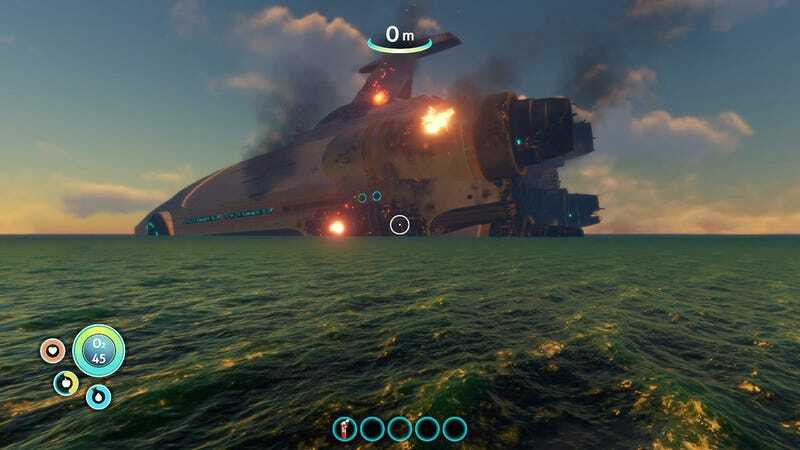 Subnautica isn’t a permadeath game, though a mode exists to play it that way. When you die, you respawn in your lifepod. I liked this slight forgiveness, especially early on, when my curiosity pushed me too far. Subnautica embraces the diverse weirdness of ocean life, filling its waters with creatures that you yearn to see up close and swim the hell away from. The starting area is known to players as the “Safe Shallows,” but it’s home to metal-loving sharks who’ll take a bite out of you, glowing manatees who release toxic gas, and adorable red fish who seem to smile at you as they chase you down and explode. In the early game you can experiment with how to deal with these enemies, and as you learn about the world they become more annoyance than threat. They pale in comparison to the dangers deeper in the ocean. To get to those depths, you craft upgrades with the fabricator, a station of glowing blue lasers that can turn a fish into a water bottle in seconds. Subnautica’s tools feel futuristic and cool, with sound effects or displays that give them presence in your virtual hands. The basics can be made right away from materials you scavenge—an expanded oxygen tank, a repair tool to get your radio working again—but others require blueprints that are scattered across the world. You soon find out you’re not the first person to crash on this planet; the sea floor is littered with wreckage. Among this debris are plans you must scan to make more advanced submarines and weapons. You’ll need these to go deeper into the ocean to try to find your way off the planet. Wreckage, being guarded by a monster that likes to hide under the sand and scare the hell out of you. Blueprints are spread through Subnautica’s open world in a way that creates a unique progression. In many survival games, you get more powerful by crafting basic gadgets that are prerequisites for more advanced ones. In Subnautica, this happens geographically: more advanced blueprints are in areas that certain kinds ot tech can help you reach. You’ll find the parts for the seaglide, a handheld motor, in the shallows, and its speed boost will get you to the depths where plans for the seamoth, a tiny submarine, reside. The seamoth can dive to 200 meters, where you’ll start to find pieces for vehicles that can go even deeper. This rewards exploration while still encouraging you to push yourself, and it helps the landscape tell the game’s story. That story is weird. When I first played the game in its early days, it had the allure of the sea but not much else. Coming back to it in preparation for its 1.0 launch, I was delighted to find bizarre visions, cryptic distress signals, and glowing tablets. Saying much more would spoil the pleasure of letting the mysterious story unspool. Trust me that it’s worth experiencing. You can also ignore it. You’re free to follow whichever strange thing catches your eye; there’s little in the way of a tutorial or guidance for what you should do next. I found a mysterious building while exploring, but later on, a story beat led me back to it. I’ve tried my hand at diving without the seaglide to speed me up (I drowned), and I’ve regularly swum to places it would be safer to use a submarine to reach (monsters ate me). This freedom can be confusing or even frustrating. I’ve made a plan only to be hampered by bad luck finding the blueprint pieces I need, or I’ve swum around aimlessly, not sure what was supposed to happen next. Eventually, though, Subnautica finds a way to put you back on track with a radio broadcast or something interesting to explore. The game is the familiar combination of relaxing and tense that many survival games are, but the loose layout of its story and its freedom is special. A reefback. They don’t...seem to be dangerous but who even knows anymore. You could probably barrel straight to the end of the story with the help of a wiki to guide your way. Or you could spend your entire time building a lovely home base, decorating it with unnecessary wall plants and furniture while ignoring the distress signals completely. A jaunt through the game’s guides and forums reveals places and monsters I can’t even imagine existing. I have no idea what they’re doing out there, but I’m excited, and terrified, to find them.